After Council meetings, I post Notes here and to my mailing list of items I think of interest to our Council District 5. This item had been placed on the table one month ago so that we Councilors could hold informational meetings and ask questions of the Health and Human Services Department and the three vendors chosen to provide Medicaid services for the state for the next 5 years. This is a five-year contract and the most money spent on a contract – almost one billion dollars! After two public informational meetings and many emails back and forth, I felt I could support this contact and voted in favor. It begins July 1. Rivier University is planning on building a new Science Center and Athletic Building. I held a Public Hearing on the campus and the item was voted on by the Council. You may remember that the Council tabled the raises for the Liquor Commissioners and other top management officials at our last meeting. We decided to postpone their raises until audited numbers are released later this year and then re-visit the raises. They had not met their targeted numbers in two of the last three years and expenses had risen considerably. #19 Authorized the Bureau of Highway Maintenance, Well Section, to enter into a contract with Skillings & Sons Inc., Amherst, NH, for the decommission of existing abandoned drilled wells on the properties of Nate Boutwell, Pelham, NH, and NHDOT, Salem, NH, in the amount of $18,000. Effective upon G&C approval through June 28, 2019. 100% Highway Funds. #43 Authorized to award an Aquatic Resource Mitigation Fund grant to the Francestown Land Trust Inc., Francestown, NH, in the amount of $185,000 for the purpose of conserving two parcels of land with 2,000 linear feet of frontage on the South Branch of the Piscataquog River in Francestown. Effective upon G&C approval through December 31, 2019. 100% ARM Funds. #49 Authorized the Division of Fire Standards and Training and Emergency Medical Services to enter into a grant agreement with the Town of Dunbarton for a total amount of $13,716 for the purpose of implementing a mobile integrated healthcare program called NH Project FIRST. Effective upon G&C approval through September 29, 2019. 100% Federal Funds. 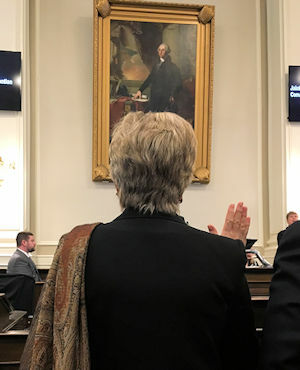 The next Governor and Council Meeting will be held Wednesday, February 6, 2019 at 10:00 a.m. in the Council Chamber at the State House in Concord, NH. Our meetings are open to the public. Comments are not taken but the public may observe our discussions on items and our votes. Concerning the Liquor Commission items, there was a discussion about the Commissioners receiving a substantial raise since profits have not made their targets the last two out of three years and expenses are going up considerably. We decided to table the item and give the Commissioners a chance to speak with us about this. I am enjoying being back on the Council after a 4 year retirement. #76 Authorized to enter into a memorandum of agreement with the Department of Education, Concord, NH, for lead removal in drinking water at NH's schools, in the amount of $1,600,000. Effective upon G&C approval through December 31, 2020. 100% Drinking Water and Groundwater Trust Fund. #84 Authorized a loan agreement with Pennichuck Water Works Inc., Merrimack, NH, in the amount not to exceed $3,375,000 to finance water system improvements. Effective upon G&C approval. 100% Drinking Water and Groundwater Trust Fund. A portion of these funds will be spent in Nashua and Merrimack. #115 Authorized the Division of Public Works, Design and Construction to enter into a contract with Turnstone Corporation, Milford, NH, for the demolition and construction of the Hooksett Turnpike Administration Building, Hooksett, NH, for a total price not to exceed $3,075,900. (2)Further Authorized the amount of $115,000 for payment to the Department of Administrative Services, Division of Public Works Design and Construction, for engineering services provided, bringing the total to $3,190,900. Effective upon G&C approval through March 2, 2020. 100% Turnpike Funds. #62 TABLED Authorized an annual salary step increase for Joseph W. Mollica, Chairman, in the amount of $5,871.84 from Grade II, Step 6 $118,707.68 to Grade II, Step 7 $124,579.52. Effective January 18, 2019. 100% Liquor Funds. #63 TABLED Authorized an annual salary step increase for Mark C. Armaganian, Director, Division of Enforcement and Licensing, from grade GG, step 6 $103,059.32 to grade GG, step 7 $108,149.08. Effective January 18, 2019. 100% Liquor Funds. #64 TABLED Authorized an annual salary step increase for Michael R. Milligan, Deputy Commissioner, in the amount of $5,549.96 from Grade HH, Step 6 $112,255.52 to Grade HH, Step 7 $117,805.48. Effective January 18, 2019. 100% Liquor Funds. #65 TABLED Authorized an annual salary step increase for Nicole Brassard-Jordan, Director, Division of Marketing, Merchandising and Warehousing, from grade GG, step 6 $103,059.32 to grade GG, step 7 $108,149.08. Effective January 18, 2019. 100% Liquor Funds.